Arizona Electric Power Cooperative, Inc.
Tri-Stte Generation and Transmission Association, Inc.
Western Fuels is a not-for profit cooperative that supplies coal and transportation services to consumer-owned electric utilities throughout the Great Plains, Rocky Mountain and Southwest regions. Serving a wide variety of public power entities ranging from rural electric generation and transmission cooperatives to municipal utilities, WFA offers its Members diverse and extensive expertise in coal mining, coal procurement and transportation management. Western Fuels Association, founded in 1973, is a cooperative enterprise operating on a not-for profit basis to provide coal and other services for the generation of electricity by consumer owned utilities. Where WFA intends to expand its membership base to include investor owned utilities and industrial consumers of coal, current member-owners are rural electric generation and transmission cooperatives, municipal utilities and other public power entities. For nearly four decades Western Fuels has utilized its considerable and diverse experience to provide comprehensive fuel chain management services to a progressive membership that today includes Basin Electric Power Cooperative, Kansas Board of Public Utilities, the Board of Public Municipal Utilities of Sikeston, Mo, Sunflower Electric Power Corporation, Southern Minnesota Municipal Power Agency and Tri-State Generation and Transmission Association. To date, Western Fuels was responsible for the delivery of over 575 million tons of coal on behalf of its members. 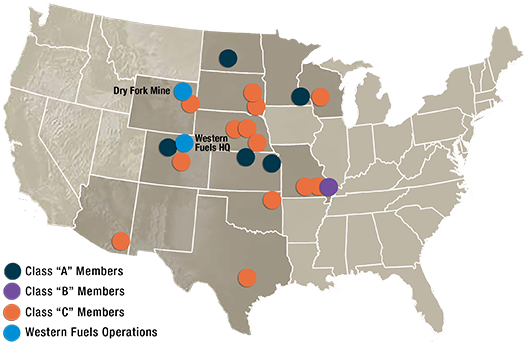 Western Fuels has actively purchased coal from each coal producer in the Southern Powder River Basin; owns and operates the Dry Fork Mine in the PRB, and also owns or leases approximately 1,400 rail cars to service that membership. Western Fuels also represents your industry interests through active trade organization membership in Western Coal Traffic League, National Coal Transportation Association, ACCCE and the National Mining Association. We promote and protect member interest with volume driven contracting, comprehensive and cost effective fuel chain management, a time tested staff and the strength of collective advocacy. Put Western Fuels to work for you.